In the previous part, we had seen bhagavAn informing bhagavadh rAmAnuja that inspite of rAmAnuja’s various misdeeds, he was fulling his desires only because SrI rAmAnuja recited dvayam, somehow or the other. We shall continue from there. kEvalam madhIyaiva dhayayA niSSEsha vinashtasahEthuka – kEvalam – only; madhIyaiva dhayayA – my mercy alone; niSSEsha – without leaving anything; vinashta – completely removed; sahEthuka – with causes. bhagavAn says that it was only due to his mercy that all the hurdles (without leaving anything) mentioned earlier were totally removed, along with their causative factors. By using the word “kEvalam” bhagavAn says that to remove the effect of the hurdles mentioned, there is no need to seek any remedy or atonement. His mercy alone is sufficient. What are these hurdles? machcharaNAvindha yugalaikAnthikAthyanthika parabhakthi paragyAna paramabhakthi vigna – math – my; charaNa – exalted feet; aravindha – lotus; yugala – two; aikAnthika – absolute or complete; athyanthika – endless; parabhakthi – knowledge about bhagavAn; paragyAna – ability to have dharshan (vision) of bhagavAn; paramabhakthi – attaining bhagavAn; vigna – hurdle. The hurdles are those which prevented SrI rAmAnuja (all the sins and misdeeds that he had committed, as we had seen in the first part of this chUrNai) from realising parabhakthi, paragyAna, paramabhakthi at the two exalted lotus-like feet of bhagavAn and carrying out kainkaryam to him. math prasAdha labhdha – math – my; prasAdha – grace; labhdha – obtain. bhagavAn says that SrI rAmAnuja will get, out of his grace, these also. What are these? machcharaNAvindha yugalaikAnthikAthyanthika parabhakthi paragyAna paramabhakthi – math – my; charaNa – exalted feet; aravindha – lotus; yugala – two; aikAnthika – absolute or complete; Athyanthika – endless; parabhakthi – knowledge about bhagavAn; paragyAna – ability to have dharshan (vision) of bhagavAn; paramabhakthi – attaining bhagavAn. In the earlier verse, bhagavAn mentions about the removal of hurdles for carrying out kainkaryam to his exalted feet. In this verse, he says that SrI rAmAnuja will get complete and infinite knowledge about bhagavAn, have vision of bhagavAn and attain him so that he could carry out kainkaryam to his exalted feet. Not only these, but further also. math prasAdhAdhEva sAkshAthkrutha yathAvasthitha mathsvarUparUpa guNavibhUthi leelOpakaraNa visthAra: – math – my; prasAdha – grace; Eva – only; sAkshAthkrutha – obtain through one’s own eyes; yathAvasthitha – as it is; math – my; svarUpa – basic nature; rUpa – physical form; guNa – auspicious qualities; vibhUthi – SrIvaikuNtam; leelOpakaraNa – tool for my pastime; visthAra: – extent (dimensions or boundary). 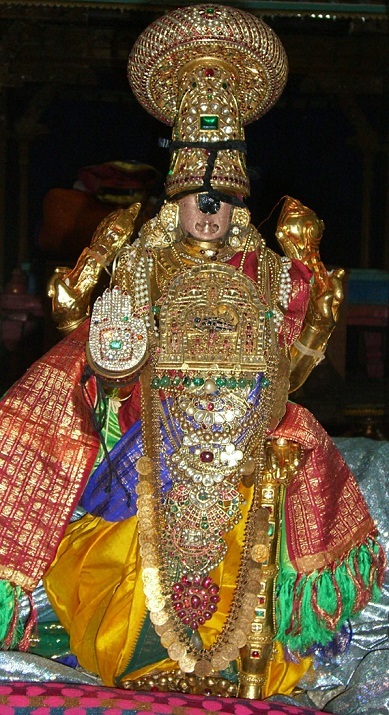 bhagavAn says that only due to his grace, SrI rAmAnuja would be able to see with his own eyes all the entities of bhagavAn – his basic nature, his wonderful physical beauty, his auspicious qualities, his wealth, both in the leelA vibhUthi (this world where we live) and nithya vibhUthi (SrIvaikuNtam) as they are. One may wonder, is there anything other than “as they are”? Can we also see things which aren’t there? vyAkyAthA periyavAchchAn piLLai says that in bruhadhAraNyaka upanishadh, under the chapter gArgy vidhyA, someone says that these are all bhagavAn’s entities, which are all false. Hence bhagavAn says that SrI rAmAnuja will see his entities as they exist. Also, if SrI rAmAnuja were to see on his own, he might not see the proper entities, and hence bhagavAn says mathprasAdhAdhEva – with my grace alone. More than that……. aparOkshasidhdha manniyAmyathA madhdhAsyaika svabhAvAthmasvarUpa: – aparOksha – perceptible; sidhdha – ready; math – my; niyAmyatha – control; math – my; dhAsyaika – servant only; svabhAva – nature; Athma – self; svarUpa – nature. We can hear about bhagavAn; we can think about him and meditate continuously about him. But if we are able to see him directly with his grace, isn’t this far superior to the other methods (of hearing, thinking etc)? Once his grace comes to us, our AthmasvarUpam (nature of oneself) blossoms in all its grandeur and we see ourselves for what we are: that we are under his control (he directs us from inside) and that we are his servitors (dhAsya). This is called us Athma svarUpa sAkshAthkAram (seeing/understanding the self as is). Once we get this AthmasvarUpa sAkshAthkAram……. madhEkAnubhva: – math – my; Eka – only one; anubhava – experience. Once we get this AthmasvarUpa sAkshAthkAram we can not stop without experiencing him. Once the knowledge about self dawns on us, it will not stop at knowing that AthmA is full of gyAna (knowledge) and Anandha (bliss). It will take us to svarUpa yAthAthmyam (knowing about self, as it is). What is this svarUpa yAthAthmyam? It is knowing that we are fully subsistent on bhagavAn for everything. It is not our nature to enjoy ourselves (kaivalyam or AthmA enjoying self). It is our nature to serve him always. This service to bhagavAn will make him happy. It is not our nature to feel happy that we are serving him. This is very important to understand. We should not enjoy ourselves as it becomes kailvalyam. We should not feel happy enjoying bhagavAn as it becomes svArtha param (benefit for one’s own purpose). We should feel happy that we have become an entity which bhagavAn will enjoy for his pleasure and his pleasure should be the cause for our happiness. We should be bhOgyam (entity for pleasure) and not bhOkthA (one who enjoys pleasure). Our happiness comes out of his happiness. We should not say that “he is my Lord”, but we should say that “I am his servitor”. While both mean the same, in the first part it is “I” who is prominent while in the second, it is “He” who is prominent. The AthmA’s love comes out of being bhagavAn’s servant. In thiruvAimozhi 3.3.1, nammAzhwAr says that throughout his life, he should be with bhagavAn and carry out faultless service. What is the fault in service? It is the thought that the service will bring happiness to me. kainkaryam results from love born out of experience. The experience is not mine but it is his. paripUrNAnavaratha nithyaviSadhathamAnanyaprayOjanAnavadhikAdhiSaya priya madhanubhavasthvam – paripUrNa – completely; anavaratha – incessantly; nithya – permanently; viSadhathama – very clearly; ananyaprayOjana – without any other benefit; anavadhika – unllimited; adhiSaya – wondrous; priya – loving; math – my; anubhavasthvam – experience. bhagavAn blesses bhagavadh rAmAnuja with experience which is fulfilling, without any break, always permanent, which is very clear, not looking at other benefits, unlimited, absolutely wondrous and supreme, and is full of love. thathAvidha madhanubhavajanithAnavadhikAthiSaya prIthikAritha – thathAvidha – like that; math – my; anubhava – experience; janitha – born out of; anavadhika – unlimited; adhiSaya – wondrous and supreme; prIthikAritha – caused by love. aSEshavasthOchitASEsha SEshathaikarathirUpa nithyakinkarO bhava – aSEsha – without leaving anything; avasthOchitha – appropriate states; aSEsha – without leaving anything; SEshathaika – only serving; rathirUpa – in a loving form; nithya – permanent; kinkarO bhava – be servitor. bhagavAn grants SrI rAmAnuja his wish. He tells rAmAnuja that he can carry out all services to him with the love born out of the experience that SrI rAmAnuja obtained from bhagavAn. This service would be rendered in all states, leaving nothing behind, would be permanent, unlimited, supreme. Thus bhagavAn fulfils all that Sri rAmAnuja had prayed to him, starting with removing all the hurdles in the path of getting parabhakthi, paramagyAna, paramabhakthi and ending with carrying out service in all situations with love born out of bhagavAn’s experience. Evam bhUthOsi – be like this (Let your desire become true). bhagavAn grants SrI rAmAnuja’s prayer to be a servitor at his exalted feet, always like this. We shall now go on to the 19th chUrNai. This entry was posted in gadhya thrayam, Other, SaraNAgathi gadhyam on February 4, 2016 by T N Krishnan.